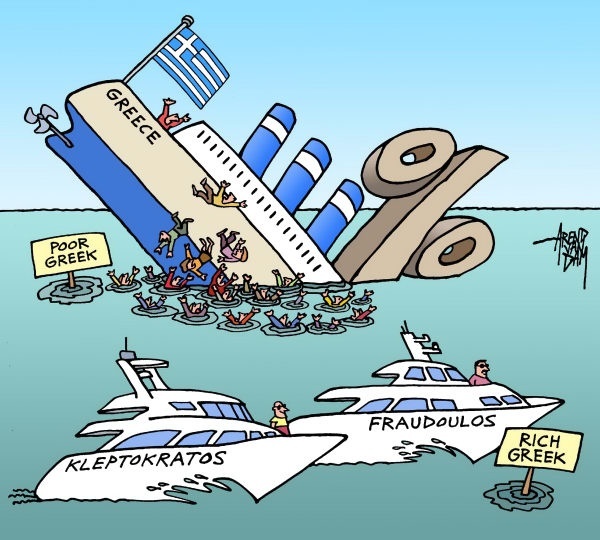 Capitalist Austerity or Socialist Revolution – Greece and Beyond! Let’s begin by saluting the workers and farmers, women and youths of Greece. They are waging a valiant struggle against the reactionary agenda of the European Union bosses and bankers. The victory of the NO, in Greek the word is Oxi, in the historic referendum on July 5, is a victory for the entire world working class. It is a sign of hope. While we have heard, in the last 24 hours, disturbing news of further concessions to the E.U. by the Greek government, to be sure, the struggle continues. Around the world, socialists and progressives should organize mass actions to demand cancellation of the odious debt, and to support the struggle for socialist transformation as advocated by the anti-capitalist electoral front, Antarsya, and by our comrades in OKDE-Spartacos, the Greek section of the Fourth International. 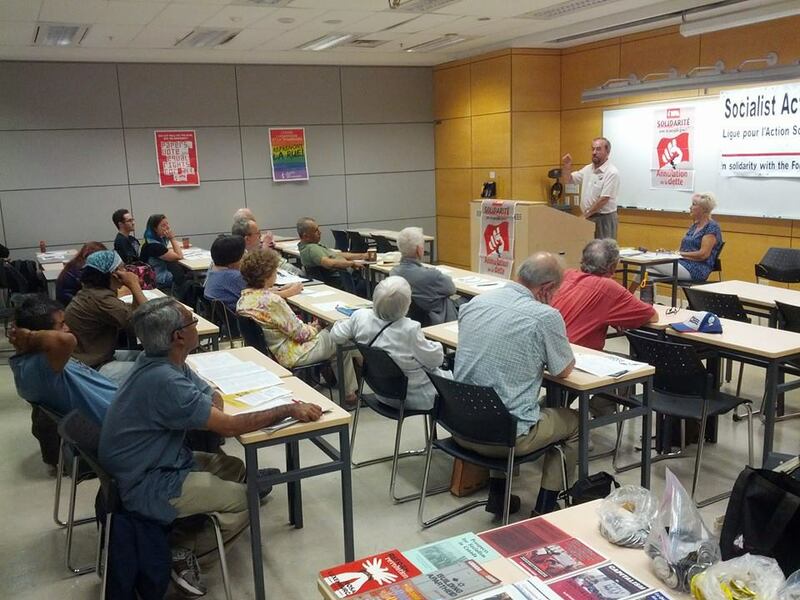 Socialist Action’s forum ‘Capitalist Austerity or Socialist Revolution – Greece and Beyond’ at Toronto People’s Social Forum on July 11, 2015. Between June 18 and July 6, I was in Europe. Particularly in the last eight days, I had the opportunity to meet with anti-austerity activists. In Paris I attended a conference of the French Trotskyists, about a hundred members of the Anti-capitaliste et Revolution current, which is part of the Nouveau Parti Anti-capitaliste. In addition to Socialist Action representatives from Canada and the USA, there were revolutionaries from Greece, Spain, Italy, and of course, France, including observers from other French parties. I walked with 4,000 people in Paris in defence of Greece and against the troika on July 2. Earlier, in Stockholm, I spoke with members of the Socialist Party, the Swedish section of the Fourth International. What really struck me is the similarity of the attacks faced by the working class everywhere. In Spain, union rights are being curtailed. Coca Cola workers are battling major layoffs and re-structuring. Strikes by miners and health workers are repressed, and struggles for national liberation, as in the case of Catalonia, are being blocked by the state. At the same time, the two main parties of bourgeois rule are in a deep crisis, dropping from 75% popular support to 45%. The left populist party Podemos has filled the void. But it has retreated from its founding policies, which were to cancel the debt, nationalize the banks and reverse the cuts to retiree pensions. It is even exploring an alliance with the Socialist Workers’ Party of Spain (PSOE), which governed up to 2011 and carried out severe austerity measures. In France, the SP government of Francois Hollande, together with the Green Party, have implemented very aggressive pro-business policies. They wage a war of intervention in Mali, and target migrant workers from Africa and Eastern-Europe for discrimination and deportation. On May 8, tens of thousands of workers struck across France against austerity measures, but were hit with legislation forcing them back to work. Postal and railway workers, sectors where the NPA has significant influence, are leading the way in resisting the bosses’ agenda with local walkouts and work place occupations. The Hollande government, opportunistically used the Charlie Hebdo tragedy to promote ‘national unity’ in support of its own agenda. But it did not last. The Left Front, dominated by the Stalinist French Communist Party (PCF), aims to channel the radical resistence into a pro-capitalist government. Our comrades describe it as ‘reformism without reforms’. This phrase also applies to Syriza in Greece. Syriza is dominated by a current that, in the 1970s, split to the right from the KKE, the Greek Communist Party. Syriza incorporates a number of smaller leftist parties which accept its reformist project. Since Syriza came to government in February, in alliance with a ANEL, a right wing nationalist party, it has broken almost all of its promises. It promised to reverse austerity measures, to refuse to pay the odious debt, to raise the minimum wage, improve collective bargaining rights and cut military spending – pledges all since abandoned. It re-opened the shuttered national public TV service, but it betrayed the demands of the workers who occupied the studios. It re-established a top-down management model. It is proceeding with privatization of the Port of Piraeus, selling it to Chinese interests. 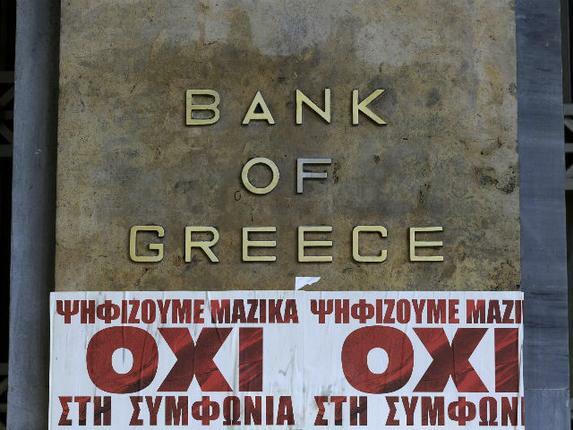 Syriza has dampened workers’ aspirations. It agrees to austerity — just not as much as demanded by the E.U. The gap last week between the two sides is only $1 Billion. The referendum was an act of political survival. The class struggle has sharply intensified in Greece since June 27, when Greek Prime Minister and Syriza Party leader Alexis Tsipras called on the people to vote NO in a referendum against blackmail and humiliation by Greece’s capitalist creditors. On Sunday, July 5, nearly 62% voted NO, and only 38% voted YES. In working-class districts the vote was 80-to-90% NO, while in upper-class districts it was 80-to-90% YES. “The “NO” answer in the 5th of July referendum was a painful slap against the traditional parties of Capital, the bourgeoisie, and their media. In the short period before the referendum, this cabal extorted and terrorized the people, using all means available: via television, through newspapers, in the work places. They only managed to make fools of themselves and to increase the class hate [of the working class against them] even more. The referendum turned into a pure class fight, regardless of Syriza’s intentions. The working class voted NO and rejected the settlement massively, despite the historical betrayal by the General Workers’ Union bureaucracy, which sided openly with the “YES” and with the capitalists. The bourgeoisie fought hard in favor of YES, even those parts of it which weren’t hostile to Syriza. The majority of the middle class, having almost nothing to lose, joined with the working class and voted NO. Contrary to those who called for national unity and amity, it became clear to everyone that two, totally different “societies” exist in the country: The exploiters and the exploited. The rise in class consciousness of a large part of the working class creates a big fear for those who are afraid of the anger of the working class and choose national unity as their main slogan, in order to promote complacency and social peace. Those who tried to avoid a clear stand in this class fight naturally found themselves on the fringes. Especially the Communist Party (KKE). It urged voters to abstain in the referendum. This class struggle wasn’t limited to the vote. It took place in the streets, in the work places, inside the universities, in the neighborhoods. Without the huge demonstrations and marches, fear would have prevailed and the outcome of the election would have probably been different. The anti-capitalist Left and the revolutionary organizations played a leading role in the NO movement, and put pressure on Syriza not to sign the agreement initially. Especially ANTARSYA, despite partial mistakes, became the strongest feature of the most dynamic and decisive part of the movement. The anti-capitalistic Left is a social and political reality in the streets and in the work places. Syriza has no right to think that this movement is its property. The confidence this NO victory gives us should not lead to complacency. Hard battles are coming. Without a doubt, Syriza will return to the table in order to discuss austerity measures, with the hope that E.U. institutions will be lenient. Also, without any doubt too, the bourgeoisies of Greece and Europe, along with the bureaucrats of EU, will try to take revenge. We should not let the NO be “stolen,” nor to degenerate into a scrap of paper. The class front, which struggled in favor of NO, should reject any new agreement and any new measures. It must demand salary increases and collective agreements. It must impose a break with the IMF and the EU. It must demand nationalization of the banks and big corporations, under workers’ control, as the only solution against the banks’ extortions and the bosses’ sabotage. It must disarm the police, which even under the Syriza government, protected the YES demonstrations and suppressed the NO demonstrations. It must completely smash the Nazis of the Golden Dawn Party, who are trying to exploit a part of the NO movement, a NO that they falsely supported for political survival. We do not have the slightest illusion that the Syriza-ANEL government will pursue austerity. We are confident that the power of the workers can stop it. How did Greece get so deeply in debt? By buying German products on credit. The main purpose of the E.U. has always been to benefit its dominant powers – the capitalist rulers of Germany and France. Loans, at high interest rates, kept production humming in the north, and turned the European south and west into debtors. It’s not enough for the German bankers to turn Greece into a semi-colony; they want to do the same to the former deformed workers’ states in eastern Europe. And that means dismantling the welfare state, and all the social benefits of the working class across Europe. Scandinavia is the last bastion of social democracy. Denmark, Norway and Sweden have kept their own currencies. But, as Swedish comrades told me, they are battling cutbacks, opposing efforts to privatize social services, to allow rich people to jump the queue for elective health care, to establish charter schools, and to give corporations tax relief. The pressure from austerity has fostered division in the working class, strengthening anti-immigrant, right wing parties. So, you see, you cannot have social democracy, let alone socialism, in one country alone, in the face of globalization. Back in Greece, which is a small imperialist state, the problem of exploitation from without was compounded by boss class sabotage from within. Greek capitalists, large and small, stopped paying taxes decades ago. Conservative governments, one after another, did little about it. So, public debt piled up. The corporate media blamed workers and pensioners for being greedy – a big lie – and German bankers were only too happy to provide loans to spur consumer spending. That prompted Greek governments under New Democracy and PASOK (the former social democratic party) to slash wages, public employment and pensions. General misery spread, youth joblessness rose to 60%, and the rate of suicide spiked. But doesn’t everybody have to take a hair cut in hard times? No. Germany has never repaid its external debt. Neither after the First nor the Second World War. As French economist Thomas Piketty pointed out, Germany got more than the benefits of the Marshall Plan. In 1953, 60% of its foreign debt was cancelled, and its internal debts were restructured. But this kind of treatment is only for members of the club of imperialist bullies. 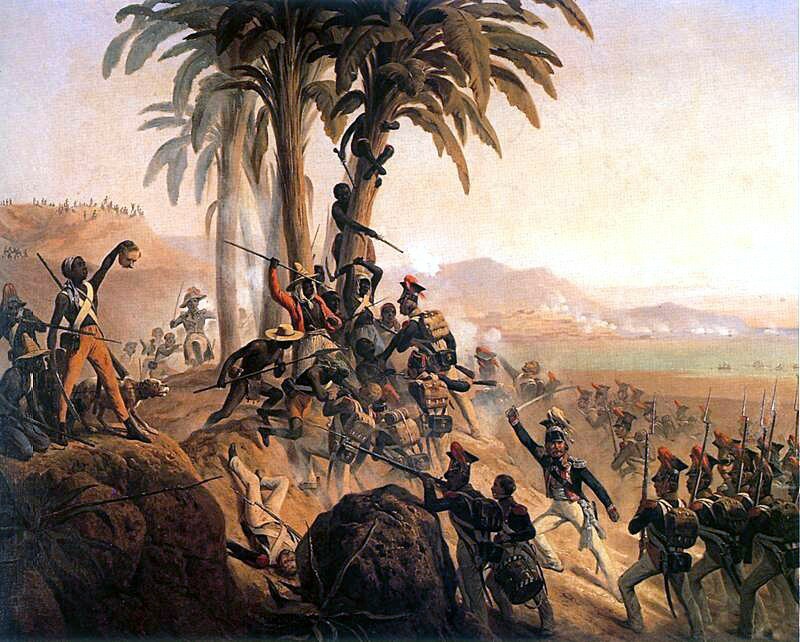 Battle between Polish troops in French service and the Haitian revolutionaries. was saddled with over a century of debt payments that wrecked the economy. Why do the big capitalist powers act this way? It is due to the very nature of the capitalist system. It is an irrational system, marked by business cycles with giddy upswings and ferocious downturns. And it has an endemic contradiction. It is called the tendency for the rate of profit to decline. Have a look at the graph from American Marxist economist Michael Roberts. Since the 1860s, there have been ups and downs in the world rate of profit. But the general trend is down. This has to do with the organic composition of Capital. The make-up of Capital. The more capitalism relies on machines, the less it relies on labour. Capital can squeeze more profit out of workers, when conditions enable the bosses to do so. But Capital cannot squeeze more profit out of machines. Their costs are fixed, and the more the rulers replace workers with machines, the more their profits are limited. Then the options for the super-rich are these: wars of re-conquest, massive destruction of property (and people), plunder of resources, and the smashing of workers’ organizations. The plunder of resources adds to the biggest existential crisis facing civilization: destruction of the environment, and escalating climate change. Capital tries to externalize its wastefullness and toxicity, but there is a limit to that too. Extreme weather events, and loss of habitat and species, know no borders. In the words of a well-known book title, “This Changes Everything”. It is truly “Capitalism versus the Climate”. Capitalism threatens human survival. So, what is to be done? Capitalism, the irrational system that profits from sexism, racism and war, the system that imposes an ever growing carbon footprint, has got to go. What stands in the way of the overthrow of capitalism? Obviously, big business and the state do. The capitalist political parties do. But so do the reformist leaders of the working class. Only the working class is capable of transforming class society. Workers need to be convinced to do this, which is the job of a class conscious vanguard, organized in a revolutionary party. One of the obstacles that the vanguard encounters is the layer of relatively privileged, full-time union office-holders. Most them defend the prevailing power relations. For real change to occur, the unions must be transformed. Instead of being class collaborationist bodies increasingly integrated into the state, unions must become instruments of class struggle, run from the bottom up, and dedicated to workers’ power. This change will occur only by the intervention of organized socialists. But on what issues, where, and how, should socialists intervene? What are the main elements of a Workers’ Agenda? In terms of foreign policy agenda, Stephen Harper should be told where he can stuff his CF-18 jets. We need to say Hands off Iraq and Syria. No troops to Ukraine. Hands off Venezuela. Canada out of the Middle East, Africa, and Haiti. Canada out of NATO. Ottawa delivers jets to NATO, and drops bombs on Syria, but says it can no longer deliver the mail to your home. Its priority is pipelines, not postal service. 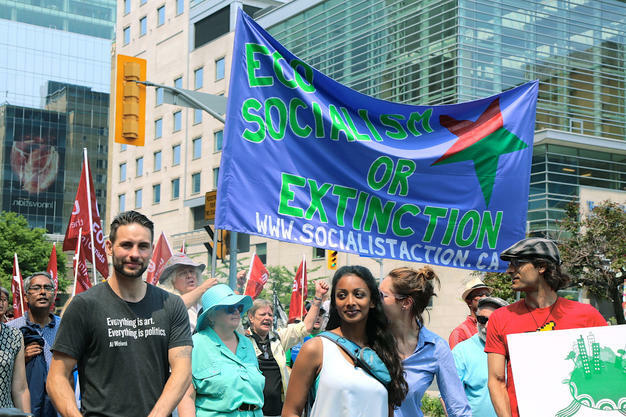 On September 20 some four hundred people answered the call of Socialist Action to picket the office of Conservative Finance Minister Joe Oliver in uptown Toronto. 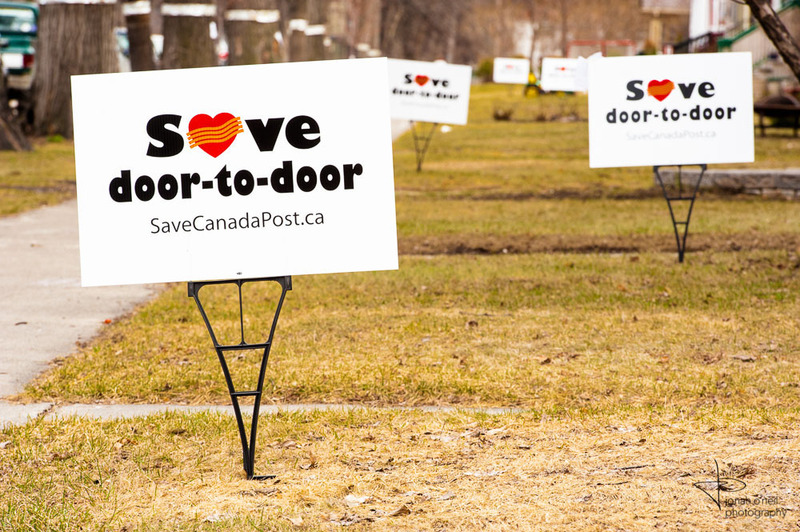 More than a dozen labour unions, political parties and community groups rallied to demand that Canada Post Corporation and the federal government reverse the decision to phase out home mail delivery to over 5 million addresses. The Tory plan is to gut the federal public sector, to shrink postal workers’ pensions, and to break a progressive, democratic union. The aim is to sell the profitable parts of Canada Post Corporation to private sector vultures. The struggle continues. Our plan is quite different. It is to repeal the Anti-Terrorism Law, to stop pipeline construction, shift to green energy production, and enter into a respectful partnership with indigenous peoples. Sadly, the Ontario provincial government under Liberal Premier Kathleen Wynne was re-elected last June. Why? Some heads of unions focussed exclusively on defeating Tory Tim Hudak. Ontario NDP leader Andrea Horwath ran a conservative, populist, anti-tax campaign. So the government that squandered a billion dollars on unwanted gas plants, that suspended free collective bargaining and the right to strike for education workers, that froze wages, cut public services, raised university student fees and watched gridlock and decay tighten their grip on Canada’s biggest city, won by default. Let’s look at the Toronto municipal election. Last October 27 voters went to the polls to remove a bozo politician. But we continue to be saddled with his anti-worker, capitalist austerity agenda at Toronto City Hall. Why? Well, John Tory is a Tory, and he’s channeling the failed big business policies of the past. Taxes and user fees go up and up, while public transit, public housing, libraries, the arts and recreation facilities are starved of funds. That problem did not start with Rob Ford. It developed during decades of malfeasance and neglect, under David Miller, Mel Lastman and their predecessors. The problem is systemic. Growing decay and glaring inequality in Toronto stem from an unwillingness to tax the rich, and to fund solutions. That unwillingness comes from big business control of City Hall and the Toronto District School Board. So long as the profit-obsessed master class rules, the vast majority of the people suffer. It is necessary to make big business, the giant banks, land developers and wealthy religious institutions bear the burden of funding vital social needs. Of course tax reform can be rapidly reversed. Socialists argue that the battle for wealth re-distribution must rise to a struggle for public ownership and workers’ control of the commanding heights of the economy. Only by expropriating Capital and investing the wealth produced by working people, according to a democratic plan, in harmony with nature, can human needs for good health, housing, education and culture be met. That is a key element of a Workers’ Agenda. It culminates in the formation of a Workers’ Government. Socialist Action fights for working class political representation, combined with socialist policies. We say the NDP should hold a Toronto city convention to discuss and adopt a Workers’ Agenda, and to select candidates for all municipal offices. Such candidates would be held morally, organizationally and politically accountable for their actions — as tribunes of the working class. In fact, the Toronto Area Council of the NDP adopted that idea last December. Now we are working to implement it. In about three months there will be a federal election. The appetite for removing Harper is overwhelming. But let’s not lose our bearings. It would be foolish to replace Bay Street’s ‘A Team’ with Bay Street’s ‘B Team’. Justin Trudeau and the Liberal Party illustrated this point by voting for Bill C-51, Harper’s so-called Anti-Terrorism Law. The Liberal economic policy also, by default, is the business agenda. The NDP is the only mass working class party, based on the unions. However, its policies leave much to be desired. For that reason, the NDP Socialist Caucus, in which SA plays a leading role, is petitioning Tom Mulcair to adopt 4 P’s and put them at the front and centre of the NDP election platform. The 4 P’s are: public Pharmacare, no Pipelines, steeply Progressive Taxation of the rich, and Palestine solidarity, including boycott of the Zionist apartheid state. Hundreds of New Democrats have signed the petition. We may succeed in pushing Mulcair to the left. Anything is possible. Who thought the NDP would form the government in Alberta? The main point is this: to raise class consciousness and advance struggles for fundamental change, socialists need to be organized as such, and fight for socialist policies across society, including in the unions, the NDP and other working class organizations. There is no electoral solution. There is no market solution to the crisis of capitalism. The capitalist market created the problem. Only a social revolution can solve it. Only by taking control of the major means of production, like the Cubans did 53 years ago, only by instituting democratic planning, in harmony with nature, does humanity have any hope of survival. That’s what Socialist Action is all about: educating, agitating and organizing for fundamental change. That’s why we host Rebel Films, public forums and conferences. That’s why we organize demonstrations, like the rally to defend postal services, and participate in mass actions, like the 10,000 strong march for Climate Justice last Sunday. That’s why contributed to the victory of the CUPE 3903 strike at York U, and why we are involved in the coming province-wide strike of teachers, and of OPSEU members in the Ontario Public Service. That’s why our main slogan in this period is: Common Front, General Strike, Workers’ Government. Central to our strategy for workers’ power is the building of a class struggle opposition in the unions and the NDP. With supporters of Hassan Husseini’s campaign for the CLC Presidency we launched the Workers’ Action Movement. SA aims to advance the fight against the boss class. In this process a mass revolutionary workers’ party will arise. Such a party is the key to a future of freedom and prosperity. But it cannot be built without you. We need you to get involved. You may say it’s hard to find the time, but you can certainly make the time. Remember, activism is the rent we pay for living on this planet. Besides, it’s a lot of fun – in fact, it’s the most fun you can have without taking off all your clothes. So, please join Socialist Action today. Together we can make the world a better place – one that’s truly fit for human beings. Socialist Action participating in 10000 strong Jobs, Justice and Climate rally in Toronto! Its either Eco-Socialism or Extinction!